Timelapse video shows the reconstruction of a section of the Waiho River bridge previously destroyed during a heavy storm. COMPLETE SCRIPT TO FOLLOW SHOWS: FRANZ JOSEF, NEW ZEALAND (APRIL 9, 2019) (NZ TRANSPORT AGENCY - MUST ON SCREEN COURTESY NZ TRANSPORT AGENCY/ NO RESALE) (MUTE) 1. 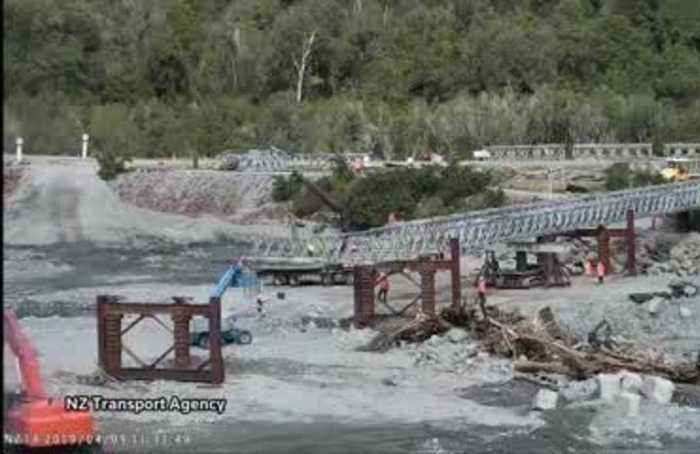 TIMELAPSE VIDEO OF BRIDGE BEING CONSTRUCTED FRANZ JOSEF, NEW ZEALAND (APRIL 10, 2019) (NZ TRANSPORT AGENCY - MUST ON SCREEN COURTESY NZ TRANSPORT AGENCY/ NO RESALE) (MUTE) 2. TIMELAPSE VIDEO OF BRIDGE BEING CONSTRUCTED STORY: A new section of a bridge destroyed by floodwaters has been rebuilt over the Waiho River in Franz Josef, New Zealand. A timelapse video shared by the NZ Transport Agency shows the construction progress made on Tuesday (April 9) and Wednesday (April 10) ahead of the opening ceremony scheduled for Saturday (April 13). The Waiho River bridge was destroyed in a heavy storm on March 26 when floodwaters washed it away. The bridge was first set to reopen on Friday (April 12) but the event had to be postponed due to delays caused by rising river levels and rain, according to the NZ Transport Agency.